This is the offer that no kid could refuse: A chance to visit Elstree studios during the shooting of REVENGE OF THE JEDI! 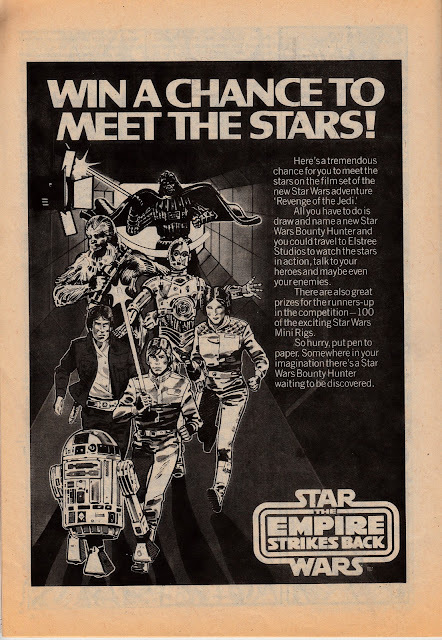 Runners-up could grab a STAR WARS mini-rig from the Palitoy range... which was a pretty crappy consolation prize considering the not-seen-on-screen toys were specifically created to allow cash-strapped fans to own a cheap SW vehicle. This advert appeared in Marvel UK's titles (specifically CAPTAIN AMERICA 51 for this particular scan) during February 1982. The promotion was to push Palitoy's ESB toy range during those difficult between-movies periods. The name of the winner, what they saw and who they met are all lost to history.... unless you know better!